As it turns out, Gamergate is only about ethics in gaming journalism about a twelfth as much as it is about harassing female game developers and critics. I mean, we've long had the anecdotal evidence that Gamergate is far more interested in making sure the women only stay in gaming if they can keep the noise down in the clubhouse and/or make the sandwiches. You know, stuff like doxxing Felicia Day in less than an hour for talking about how she's been affected while not doing it to Chris Kluwe who actually put them on blast. But then Newsweek - a place that does perform actual acts of journalism now and again - decided to dig into the data that a public content platform like Twitter makes available. You know, something that is commonly known as "ethical journalism". 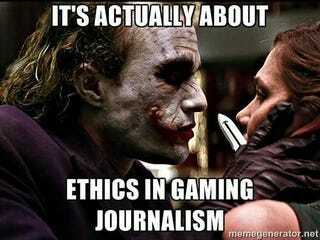 So, is GamerGate really about ethics in journalism? Newsweek asked BrandWatch, a social media analytics company, to dig through 25 percent of the more than 2 million tweets about GamerGate since September 1 to discover how often Twitter users tweeted at or about the major players in the debate, and whether those tweets were positive, negative or neutral. The idea of doing this sampling was this: If Gamergate was genuinely interested in focusing on changing the ethics of gaming journalism, you would see the biggest chunk of tweets going toward gaming journalists as opposed to gaming developers, and that there wouldn't be any difference in the level of contact received based on the person's gender. Makes sense, right? And oh, did the numbers show some interesting stuff. First, let's compare the numbers between the two people Gaters originally targeted for their ire: Game developer Zoe Quinn and Kotaku writer Nathan Grayson. I'm sure these folks on Twitter concerned about ethics in gaming journalism flooded Grayson with twe...oh, no, they didn't. Grayson received 732 tweets with the #gamergate hashtag. Quinn? 10,400. That's 14 times more. OK, so what about comparing two journalists? Let's go for Kotaku editor Stephen Totilo versus Gamasutra's Leigh Alexander. Pretty close, their level of contact, right? Maybe even a lot more toward Totilo because he is the editor of one of the supposedly "unethical gaming journalism website" while Alexander has never been accused of malfesiance but she just wrote a piece critical of gaming culture? Nope. wrong again. Totilo-directed tweets totaled 1,708, while Alexander was targeted 13,296, nearly eight times more. Note I bolded their genders in the previous paragraph for a reason. But surely, when you look at who has faced the most tweets from Gaters, it's going to reflect a focus on journalism. I mean, the official Kotaku Twitter account has had 23,500 GG tweets directed at it, that's got to mean something? And, again, neither of them has committed any supposed "ethics" violations. They're just women who disagree with #GamerGate. OK, one last angle to possibly bail the Gaters out, since we're trying to be objective. What about the tone of these tweets? Maybe there's a lot of positive discussion going on. Nope, as it turns out, negative tweets towards these people outweigh the positives by a 2-to-1 margin. So, here's what the journalism that Gaters allegedly want has shown: It has shown that given the opportunity to deal with actual journalists, they would much rather instead piss and moan at game developers. They would rather piss and moan at indie developers than the AAA studios that are far more capable of creating journalistic corruption. And, here's the key part, they would much, much, much rather piss and moan at women than at men. Remind me again what Gamergate is all about?